I am so pleased to be a part of the a2z Scrapbooking design team and wanted to try something new with my Hero Arts butterfly die for my first post, which is perfect for our January Challenge. This past week Jennifer McGuire had a video showing how to make a “no bulk shaker card”. I basically followed her instructions but did my own variation. First, I made the background for my card by inking up the HA circle lace stamp with Ranger weathered wood distress ink. Then I spritzed it with water and stamped on watercolor paper and repeated doing this until the paper was covered. If some areas were too dark, I just spritzed with a little more water and then let it dry. After trimming my paper to 4″ x 5 1/4″, I die cut the butterfly. Next I added double-sided tape all around the edges of the butterfly on the back of the card and positioned on a piece of acetate. Sprinkled on some sequins, removed the backing from the tape, placed on another piece of acetate to sandwich in the sequins and then added all to the card base. Repositioned the die cut butterfly on top by only adding glue down the center, added some more sequins and done. I purposely didn’t add a sentiment as I wanted the emphasis to be on the butterfly – and any sentiment can be added to the inside – or not! Get a 15% discount on a minimum $25 order at a2z on Etsy by using my discount code – BETTY15. The January challenge is “New to You” so give a try to a new stamp, die or technique and enter here. Now its your turn. Our challenge ends at the end of the month, you don’t want to miss out. 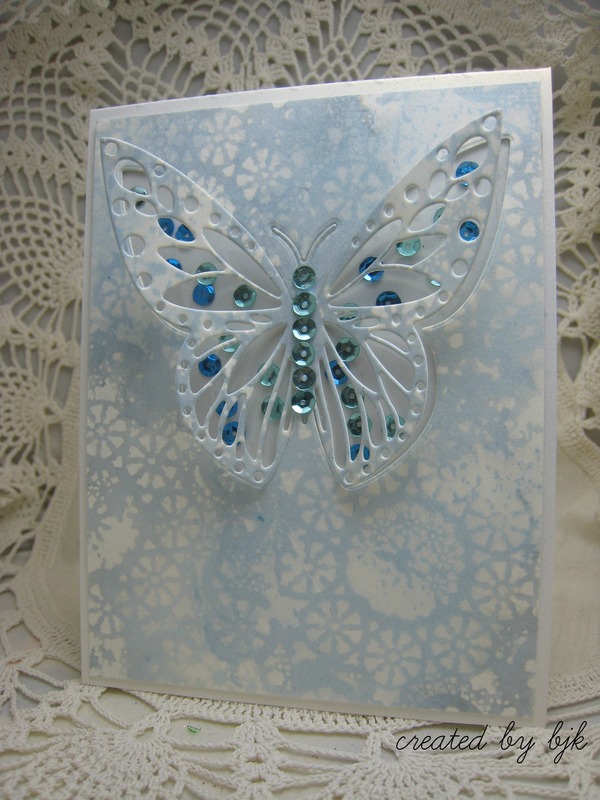 Categories: Challenges | Tags: blue, butterfly, lace, partical die cute, sequin | Permalink.